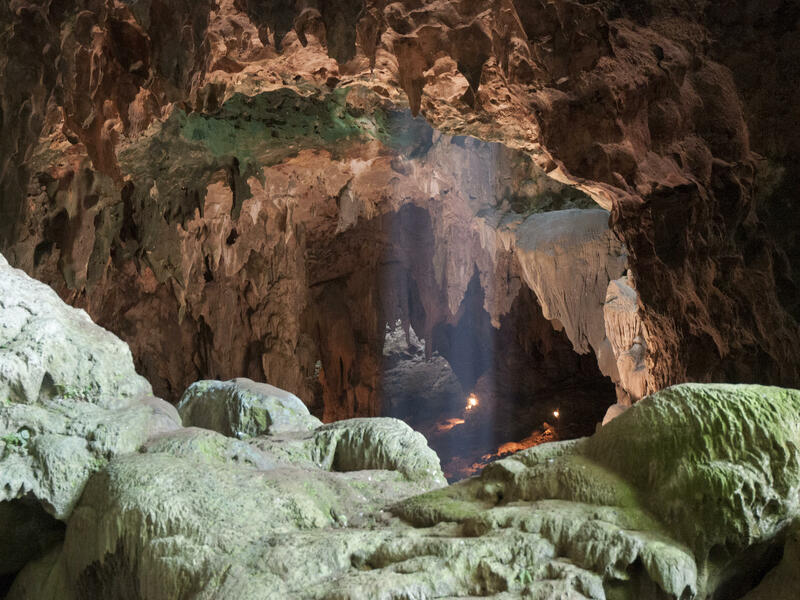 Archaeologist Armand Salvador Mijares was digging in this cave on Luzon island in the Philippines in 2007 when he turned up an ancient toe bone that wasn't quite like a modern human's. An unusual species of human apparently lived on the island of Luzon in the Philippines as recently as 50,000 years ago. Based on teeth and bones found there, scientists suspect that these early humans probably stood less than 4 feet tall and had several apelike features. Yet, the researchers say, the bones are distinctly human — from a previously undiscovered species. The first clue was a bone that surfaced in 2007. Archaeologist Armand Salvador Mijares was digging in a cave on the island of Luzon and found a toe bone. He says it didn't look like a modern human bone. "There's something peculiar with this bone," he recalls thinking. But one bone wasn't enough to say for sure who or what it belonged to. 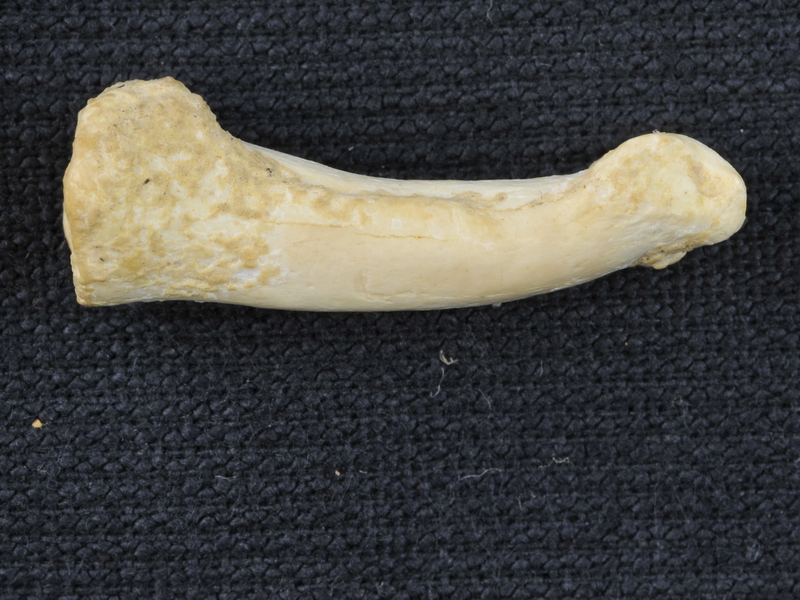 The pronounced curve of this toe bone — the proximal phalanx — from a specimen of Homo luzonensis, an early human found in a Philippine cave, looks more like it came from tree-climbing Australopithecus than from a modern human, scientists say. Mijares, who's with the University of the Philippines, was part of a team looking for bones of early humans. They kept digging for four more years. In 2011, they hit pay dirt — more toe bones, as well as finger bones, part of a thigh bone and seven teeth. And none looked like it belonged to modern humans. "We agreed that this could probably be a new species," Mijares says. Discovering a new species of ancient human is a career-maker in anthropology — or career-breaker, if you're wrong. So the team spent another eight years studying the bones and teeth. They now conclude that the skeletal fragments are from three individuals who lived sometime between 50,000 and 67,000 years ago. Writing this week in the journal Nature, the scientists call them Homo luzonensis, after the island. And, says paleoanthropologist Shara Bailey of New York University, these three are pretty unusual. "We tend to define species based on unique combinations of traits," Bailey says, "and that seems to be what's going on here." She says it's "super-surprising" how the teeth and bones exhibit some "very primitive traits" along with modern ones. For example, one toe bone is more curved than modern human toe bones. In fact, it looks just like the toe of a tree-climbing, ape-like creature, Australopithecus, that lived millions of years ago — well before the first humans evolved. Even the mouth combines an unusual mix of past and present: Some of the teeth look much like ours, while others are more like the teeth of ancestors that lived millions of years ago. Bailey calls the find a "mosaic" species: "I think it just opens up so many new questions," she says. "It's exciting." One question is: Were these creatures related to the Hobbits (no, not the movie characters). "Hobbit" is the widely used nickname for another tiny, primitive human species that lived on an Indonesian island from about 100,000 years ago until 50,000 years ago. More formally called Homo floresiensis, the Hobbits were discovered 15 years ago. They, too, had a surprising mix of primitive and humanlike bones and teeth. 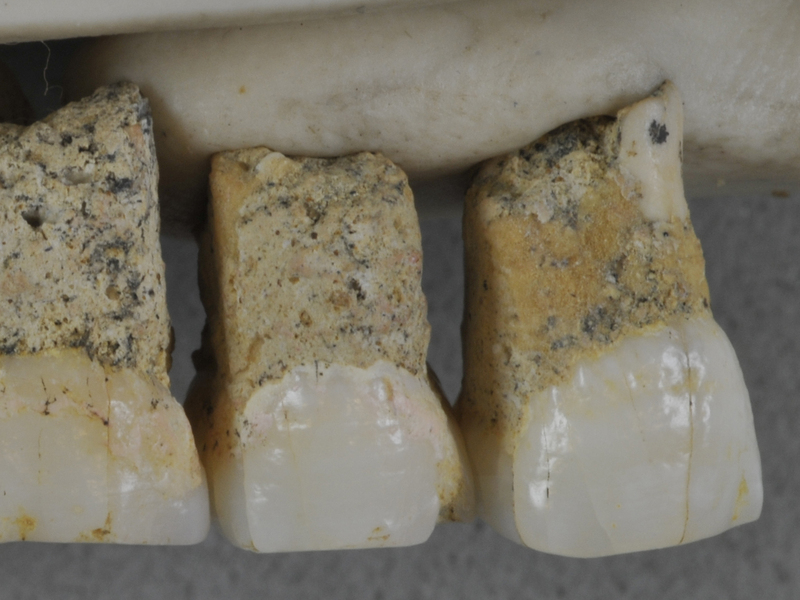 Several teeth and a few bones may be all that remain of a diminutive species of early human who lived on the island of Luzon prior to 50,000 years ago. Paleoanthropologist Matt Tocheri at Lakehead University in Canada is an expert on the Hobbits. "Here we are not that much later, and now we've got a similar thing popping up on an island in the Philippines," Tocheri says. "They're living out on these oceanic islands — and they're essentially there at the same time [as] our species is, you know, conquering the world." With two puzzling species in Southeast Asia, scientists are also wondering what it tells us about the migration of human ancestors out of Africa. The standard view holds that the first species of human to leave Africa was a large-bodied, fairly big-brained group called Homo erectus, almost 2 million years ago. Homo erectus spread through Asia and Europe. One possible explanation for the existence of Homo luzonensis is that a population of Homo erectus got to the Philippines long ago — maybe hundreds of thousands of years ago — and stayed put. As they evolved, some of their physical traits became more like those of modern humans — some of the teeth, for example. But other traits, like toes, did not evolve or may even have regressed to a more primitive form. That's the view of Florent Détroit, a paleoanthropologist at the National Museum of Natural History in Paris and one of the discoverers of the new species. He says evolution plays some unusual tricks, especially on organisms that live in isolation. "This is yet another piece of evidence to show that the features [of the body] definitely do not evolve at the same speed," Détroit says, "especially in different species in different geographical places." But Tocheri says there may be another explanation: a different migration out of Africa, not by Homo erectus but by some other more apelike species that settled in remote parts of Asia. "That's where it gets exciting," Tocheri says. "Because, if it's true that the other species of early Homo also made it out [of Africa], it means that what we're finding in Asia is even more complex and more interesting than we ever dreamed of." With two oddball species of early human turning up in the past two decades, paleontologists are wondering what the findings mean for the history of humanity. "The evolution of Homo is getting weirder and weirder," says Rick Potts, head of the Human Origins Program at the Smithsonian Institution's National Museum of Natural History. "Species are fluid entities, which makes them highly malleable, subject to change," he says. These discoveries, Potts says, "are going to play havoc with any easy classification" of our ancestors and with the notion that there was a fairly orderly progression from primitive to more "modern" traits. What is becoming clearer, anthropologists say, is that early humans came in a lot more shapes and sizes than scientists once thought. A very strange species of human apparently lived on an island in the Philippines as recently as 50,000 years ago. This creature was probably less than 4 feet tall with several ape-like features. But as NPR's Christopher Joyce reports, scientists believe it's a human relative. CHRISTOPHER JOYCE, BYLINE: Archaeologist Armand Mijares was digging in a cave on the island of Luzon 12 years ago and found a toe bone. It did not look like a modern human toe bone. ARMAND MIJARES: We know already there is something peculiar about this bone. JOYCE: Mijares, who's with the University of the Philippines, was on a team looking for bones of early humans. They kept digging for four more years. Then they hit pay dirt - more toe bones and finger bones, part of a thigh bone and seven teeth. And none looked like they belonged to modern humans. MIJARES: We agreed that this could be, probably, a new species. JOYCE: Discovering a new species of ancient human is a career-maker in anthropology, or breaker, if you're wrong. So the team spent another eight years studying the bones and teeth. They were from three individuals living sometime between 50,000 and 67,000 years ago. Writing in the journal Nature, the scientists call them Homo luzonensis, after the island. And, says paleoanthropologist Shara Bailey, they were pretty strange. SHARA BAILEY: We tend to define species based on unique combinations of traits, and that seems to be what's going on here, although I have to say I'm really super surprised because you have some very primitive traits. JOYCE: One toe bone is so curved, it looks like it belongs to a tree-climbing ape-like creature that lived millions of years ago. Some of the teeth look fairly modern, more like ours, but others are very primitive. Bailey, at New York University, calls it a mosaic species. BAILEY: I think it just opens up all these - so many new questions, so it's exciting. JOYCE: One question is, were these creatures related to the Hobbits? No, not the movie characters. Hobbits is a nickname for another tiny primitive human species that lived on an Indonesian island up until 50,000 years ago. Also called Homo floresiensis, the Hobbits were discovered 15 years ago, and they, too, had a weird mix of ape-like as well as human-like bones. Paleoanthropologist Matt Tocheri at Lakehead University in Canada is an expert on the Hobbits. MATT TOCHERI: And here we are not that much later, and now we've got a similar thing popping up on an island in the Philippines. They're living out on these oceanic islands. And they're essentially there at the same time our species is, you know, conquering the world, if you will. JOYCE: These two throwback species in Southeast Asia also raise new questions about the migration of human ancestors out of Africa. The standard view holds that the first to leave Africa was a large-bodied, fairly big-brained human called Homo erectus as long as 2 million years ago. They spread through Asia and Europe. It is possible they got to these islands, where they somehow evolved into these more primitive forms. But Tocheri says maybe there's another explanation - a different migration out of Africa by some more ape-like species, one that settled in remote parts of Asia. TOCHERI: That's where it gets exciting because if it's true that other species of early Homo also made it out, then it just - it means that what we're going to be finding in Asia is going to be even more complex and more interesting than we ever dreamed of. JOYCE: Then there's this riddle. How did they cross hundreds of miles of ocean? But questions aside, one thing is clear. Early humans came in a lot more shapes and sizes than scientists once thought. Christopher Joyce, NPR News. Transcript provided by NPR, Copyright NPR.